How to dry fresh goji berries? Drying is the ultimate process from fresh fruit to dried fruit (moisture content <13%). Whether it is natural sun drying or Machine drying Ningxia Goji Berry, it is necessary to follow the water loss characteristics of the fresh fruit, and strictly control the drying conditions in order to obtain excellent dried fruit quality and product value. The following is a brief introduction to different dry methods. This is the earliest method of using sunlight for dry farming. After picking the fresh fruit, it is directly placed on special drying fruit stacks for drying and drying without any treatment. Normally, it can be dried for 10 to 20 days in sunny conditions. The fruit is not soft and brittle, and the moisture content is between 12% and 13%. Advantages: Full use of the natural heat radiation (heat) and open ventilation environment, low carbon environmental protection, economical and cheap. Disadvantages: Affected by weather changes, drying time is long, dry slowly, fruit stack turnover is slow, may lead to fresh fruit cannot be timely drying, build up mildew. Under the conditions of sunlight, the plastic arch shed rapidly rises, usually from 10 am to 3 pm, and the temperature of the shed can reach 40°C or more, and it can prevent wind and rain and other natural disasters. Advantages: It is more environmentally friendly than ordinary daylight drying method, simple to manufacture, detachable, easy to operate and economical. Simplest drying method is Machine-drying room. During drying, the goji fruit that was left to dry for 1 day and the room temperature was maintained at about 50°C. Generally, drying can be performed in about 4 days, and the moisture content of the dried fruit is 10% to 15%. Disadvantages: The machine is located in the room, inconvenient operation, in the drying process to move up and down the fresh goji need a large workload. The hot air drying directly uses the hot blast stove. After the fan is turned on, the heated air is sent into the drying tunnel through the hot air conveying pipeline. The cold air outside then enters the heating pipe, and the heated air is then It is sent to the drying tunnel, so hot air is supplied around the clock to dry the fruit. Temperature control: The entire drying temperature is divided into three stages: the first stage temperature 40 °C ~ 50 °C, which lasted 24 to 36 hours, the fresh fruit water loss rate of 50%; the second stage temperature 50 °C ~ 55 °C, which lasted 36~48 Hours, goji berry fruit loss rate of 30% to 40%; third stage temperature 55 °C ~ 65 °C, which lasted 24 hours. 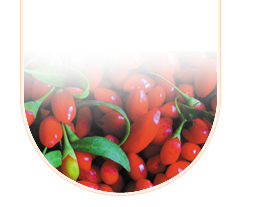 Ningxia Pure Goji Biology Technology Co.,Ltd uses this dry way to drying fresh organic goji berries. Advantages: Low equipment cost, easy operation, high heat utilization rate, high daily throughput can sip fresh goji berry fruit 1000-1200 kg per day, and the quality of dried fruit is better. PURE Biotechnology has the freeze-drying machine, and Freeze Dried Organic Goji Berry Powder. The first process is to freeze the Goji berry material to a completely solid temperature, which needs to be below 0°C. The second stage is the sublimation drying process where all the free ice is removed and the rest is dry on the surface but contains a large amount of dry matter bound to water. The third stage is the desorption, which removes the bound water. These combined waters can be removed by heating under vacuum, and the heating temperature is usually between 40°C and 60°C. The freeze-drying equipment investment is relatively large.